I think I'm going to go with the 30 ct. Even though it's stiff, which I hate, I do like the color. Well, the kids are bugging me to use the computer. Write later! Sorry to hear about your Sweet Treats nightmare! I like either fabric for the needlebook. I just bought this pattern when it came out. I would love to join your SAL. Sorry to hear about the massive frogging ... good luck and what you have looks wonderful. HOA is looking really nice to ... I love that pattern. too bad on your frogging! not fun! I agree that it's a lovely pattern! What you've worked up so far is lovely! Oh!Very cute!I thought that I have to start Sweet Treats!! I would love to join your SAL. I've been stitching part of Prairie Moon for a RR and could start the SAL anytime. So sorry to hear about your frogging the Sweet Treats. Oh how disheartening to have done all that work, I can so understand your wanting to give up, but Im glad your friend talked you out of it as its such a pretty design. 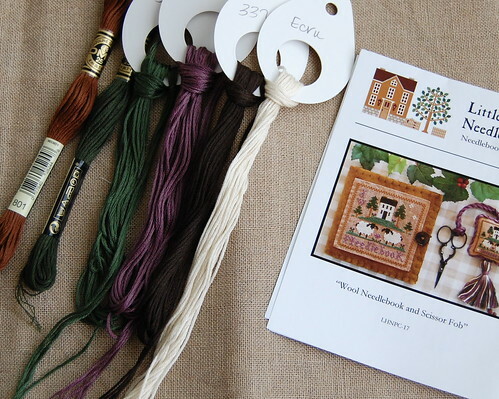 Your SAL is lovely too I have seen that made as a needlebook and scissor fob on someones blog and it was delightful. Sorry to see that you had to frog...don't give up on it! It's really cute! 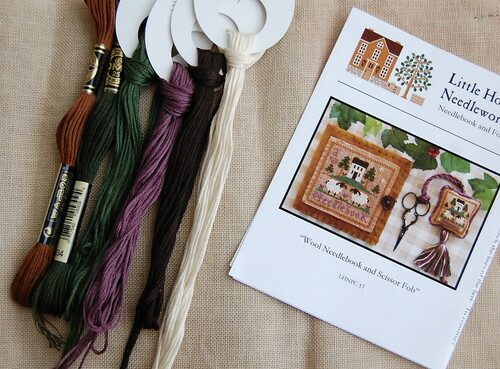 And I just finished a Wool Needlebook and fob set...it's on my blog...did you see it?! Ugh! I hate frogging. But the entire piece is so wonderful that I'm glad you kept going. I just ordered all of the thread packs for Sweet Treats a few days ago. I am going to stitch the entire set over 1 on 25 count fabric. Yours looks great! I can so sympathize! Glad you just "tore" into it and now you can put the frog way behind you. It's gonna look great! How awful that you had to pull out so much because of an error in the chart. Your SAL sounds good - I'll be watching for progress pictures from both you and Debs! Glad to see you persevered with your 'sweet treats' piece. You will be glad you took the time to fix it when it's all done. It's so cute! I'm showing my lack of knowledge, but what exactly is a SAL? How aggravating! I'd have been tempted to cast it aside, too. So sorry you had to do so much frogging! It looks great though!